Using an artificially constructed atom, known as a semiconductor quantum dot, a team of physicists has successfully demonstrated the squeezing of individual light particles. A team of scientists has successfully measured particles of light being “squeezed”, in an experiment that had been written off in physics textbooks as impossible to observe. Unfortunately, although the mathematical basis for this method – known as squeezing of resonance fluorescence – was drawn up in 1981, the experiment to observe it was so difficult that one established quantum physics textbook despairingly concludes: “It seems hopeless to measure it”. So it has proven – until now. In the journal Nature, a team of physicists report that they have successfully demonstrated the squeezing of individual light particles, or photons, using an artificially constructed atom, known as a semiconductor quantum dot. 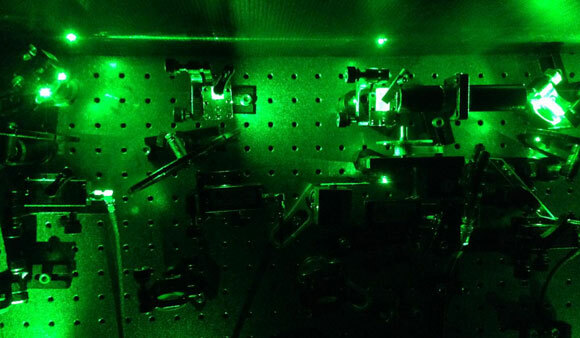 Thanks to the enhanced optical properties of this system and the technique used to make the measurements, they were able to observe the light as it was scattered, and proved that it had indeed been squeezed. It begins with the fact that wherever there are light particles, there are also associated electromagnetic fluctuations. This is a sort of static which scientists refer to as “noise”. Typically, the more intense light gets, the higher the noise. Dim the light, and the noise goes down. In the normal world of classical physics, this rule does not apply. If an object is moving, we can measure both its position and momentum, for example, to understand where it is going and how long it is likely to take getting there. The pair of properties – position and momentum – are linked. 2 Comments on "Physicists Successfully Demonstrated the Squeezing of Individual Light Particles"
Esoptrics (from a Greek word for mirror), the logic of the mirror & key to an ALGEBRAIC (and thus purely logical as opposed to geometrical) model of the Universe = the only theory to identify (and in much detail and with mathematical precision to boot) the ultimate constituents from whose COLLECTIVE behavior arises what sense imagery gives us: a kind of time & a kind of space radically different from their ultimate constituents. It’s the same as how a bowling ball’s solidity emerges from the COLLECTIVE properties of atoms radically different individually from the individual bowling balls they compose. Compare with pg. 471 of the Feb. 2005 First Vintage Books paperback edition of Prof. Brian Greene’s “The Fabric Of The Cosmos” where he states “we’ve yet to identify” the “more fundamental constituents” from whose “collective behavior” arise the characteristics of “familiar space and time” (See also his pgs. 6, 335, 350-352, 486 & 493). It’s a claim he makes because he knows nothing of Esoptrics and its way of identifying those “more fundamental constituents” far more extensively than any other theory does. On page 350, he writes of “the fabric of space” as perhaps being, on the Planck scale (i.e. : 10^-33 cm.) akin — METAPHORICALLY of course — to a “lattice or grid” between the lines of which space would be “outside the bounds of physical reality.” Only Esoptrics’ algebraic model of the Universe explains exactly why (though at 7.35×10^-47 cm.) Prof. Greene’s metaphor ideally illustrates figuratively what “the fabric of space” is ultimately in a Universe in which, ultimately, everything’s description is in Algebra’s purely logical & abstract terms rather than in Geometry’s 3 dimensional pictures. Until the issue of the “ultramicroscopic makeup of space, time and matter” (Greene pg. 493) is settled, it’s never possible to be even so little as REASONABLY sure what’s coming from this-or-that theoretical physicist regarding what’s ULTIMATELY REAL is not merely a repeat of the old story of the 3 blind men each experiencing too little of the elephant to get an accurate grasp of what’s confronting him. In explaining how familiar time and space arise from the COLLECTIVE EFFECT of c. 10^464 unique sets of REAL RELATIONS (each by its makeup giving itself a unique logical location in a septuplex framework of logical sequences) Esoptrics comes far closer to that goal than any other theory does. That is a wonderful article I really enjoyed, and it makes a lot of sense. It is interesting that reducing the noise of parts of the electromagnetic field below the standard baseline of vacuum fluctuations at the expense of increasing it at other parts is very reminiscent of “squeezing” a balloon. The presence of vacuum fluctuations made me think that maybe this universe at its entirety is an electromagnetic field, and that all things in it are different manifestations making different things, including light itself. Also, given the “Heisenberg’s Uncertainty Principle,” maybe matter is made of a constant live stream at the quantum level serving the overall intended macrolevel object. In other words, while objects are the same overall at the macrolevel, they are constantly made up of new particles at the quantum level where the old ones decay, ad that’s why you can only catch either their position or momentum.